The concepts of market place ministry and finding your 7-mountain role is embedded in the gospel of the Kingdom. We are saved through Jesus’ death and resurrection, but the invitation into the Kingdom goes beyond an invitation to church and entrance into heaven. God is inviting us to partner with him to build the Kingdom here and now, and our prayer is, “Let your kingdom come on earth as it is in heaven!” We are not just servants able to obey God; we are sons who share His heart in our own hearts. He’s the King of kings, not the King of servants. Resurrection – Technically, the disciples had been told of Jesus’ resurrection. They still didn’t expect him to show up after the cross. He walked with two of his disciples on the road to Emmaus for some distance and stayed for dinner. They didn’t recognize that it was Jesus and that he was still alive. They recalled an experience in their hearts while he was with them. The real message of Easter and all of Christianity is that Jesus is still alive and present. Our “good news” is a person, not just a philosophy or a way of life. He’s alive and his words are alive. These two disciples felt His words working in their hearts before they recognized who he was or understood what he was saying. That’s how we all come to know Jesus – it’s an experience with a person who touches our hearts. Experiencing the Prophetic “word” – the “experience” of hearing God’s voice is something that makes our hearts leap. The book, the person and the Spirit all touch the depths of our hearts in a way that leaves us with nothing hidden. There are no secrets with God; we all know that one. What is new in the Kingdom is that God is not just exposing bad things; he’s written some good things in our hearts, as well. When the desires that he wrote in our hearts get touched, it’s a prophetic experience that anyone can feel – saved or pre-saved. The prophetic gift is a tool that God uses to touch hearts through an experience. The Gospel of the Kingdom – Coming to Jesus is letting go of the old and embracing the Kingdom. Let’s make this observation: Our religious heritage is that we must first identify ourselves as sinners, repent, and then invite Jesus in. I want to change the order, because it’s the goodness of God that draws us to repentance. I want to start people out with a prophetic experience with the living word that unveils something that is already written in their hearts regarding the Kingdom. That experience is so sweet and so good that it’s not hard to convince our hearts to let go of our pathetic old lifestyles. Here’s my approach to the gospel of the Kingdom. Whether a person is saved or pre-saved, I ask them about their own heart’s desires until I sense that we touch something God has written. Then, I just pull the string on that direction for their future and encourage them to believe that their dream can come true. I’m really connecting them with the will of God and helping them to find some great reasons to let go of the things that hold them back. We are all wired by God for our Kingdom destiny. I’ve never met anyone who doesn’t like to talk about it, dream about it, and clarify a plan to make it a reality. I will even pray with them for the dream to come true or the obstacle to be broken, just so that they can experience more of the prophetic touch of Jesus in their own hearts. I’m not shy about making suggestions in these conversations, but I’m not looking for a “sale” as much as an experience. The choice for Jesus is always theirs. I put my focus on sharing my testimony of Jesus – a heart experience with the spirit of prophecy. 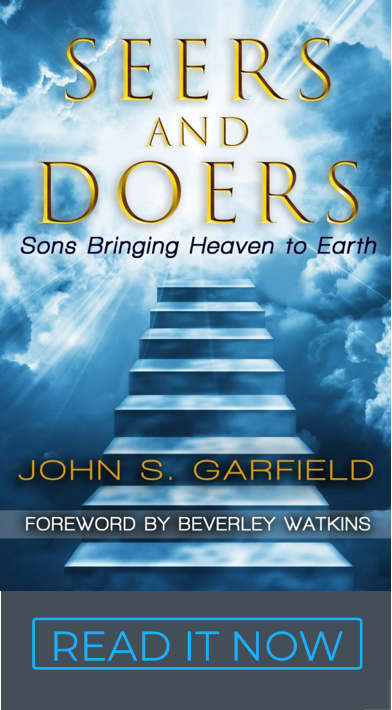 The business of the Kingdom – From the very beginning, I want to help believers to connect the dots between knowing and experiencing the living Jesus and finding the connection between the desires of their heart, their vocation and their cash flow. We can help them to get connected with their hearts in a way that touches their spirit, soul and body… right on to their personalities, talents, dreams, family, business, job, finances and lifestyle. From “Day One,” I want them to understand that they are freely saved by grace, yet created in Christ to have a role in the Kingdom and to do exploits in Jesus’ name. I want them to taste the relationship, the forgiveness, the calling, the election, the adventure and the thrill of this invitation to Kingdom. The Kingdom lifestyle – Yes, we’re saved and on our way to heaven. But we are also here to change the world, bless the nations and defeat some enemies. It’s an all-expense-paid invitation to a party that inspires us to lay our lives down for something much more important. It’s totally fun, and the people with whom we labor together are like brothers and sisters who love us just the way Jesus does, yet there are trials and persecutions on the way that seem small by comparison. We are His sons and, just like Him, we can fight battles, resurrect from defeats and be undeterred by delays. Victories and celebrations come privately and publically because we have an ongoing experience with Jesus – who is alive and well.